You are here: Home › What You Say About Us! At Hollywood Dogs we like to do things a little differently. 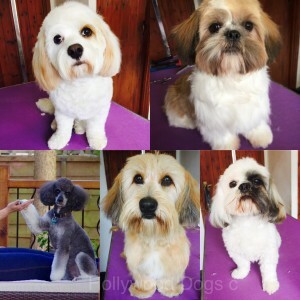 We believe in creating beautifully styled pets in a happy and relaxed environment, you will see that all pets are groomed in the window and as anyone will tell you, they all look so calm! Its something that we hear every day both from our customers and passers by, its one of the reasons that we have such a great reputation. When you bring your pet to us we will always discuss the needs of both you and your pet, in today’s busy world we understand that some customers do not have the time to devote to regular grooming and we are here to help you with this important part of your pets care. Whether it be a regular de-shedding or grooming programme or an easy to care for stylish haircut, we will always listen to your needs. We will only use the best products on your pet, our shampoos and conditioners are imported from the US and are natural and organic products, they are expensive but we believe that your pet is worth it and we do not believe in cutting corners. Thats why you can feel confident when you bring your dog to Hollywood Dogs you are doing the very best for your best friend.